Thank you to NetGalley and Harlequin Teen for this compelling, sad, and deeply affecting book. Emma suddenly loses her mother, when she dies while pregnant. Emma is plunged into a grief so all encompassing, she loses her sense of self and who she was before; a great student with plans for college and a future. Struggling mightily through this book (posttraumatic stress disorder), Emma can’t forgive her stepfather, Dan (who she loved before) for deciding (without consulting her) to keep her mother on life support in order to give the baby a chance at life. Emma really becomes hateful, angry and explosive in the way she constantly talks to Dan about her “dead mother” and questions everything in her life. As she fails classes, morns not being able to have “more time” with her mother, she begins to become a person she does not recognize but she can’t control her feelings and reactions. She has a supportive best friend, Olivia, but it is bad boy, Caleb Harrison, who is performing community service in the hospital where her mother is, that Emma begins to connect with over their shared grief and loss. Will Emma forgive Dan (and herself) in the wake of her mother’s death and daily visits to her bedside? This is a deeply affecting story and I loved the friendship and romance aspect of the book. As an adult, I understood the trauma that Emma suffered but couldn’t seem to rise above and I worry that this aspect of the book might not speak to teens (simply because they don’t understand Emma’s constant thoughts and dialog) but Elizabeth Scott did a masterful job in portraying Emma’s and Caleb’s self- disintegration. It is difficult to read their hurt, grief, feelings of betrayal for 256 pages, but the deep themes will resonate and spark discussion. 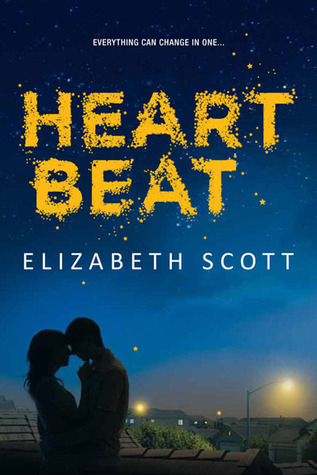 Sign into Goodreads to see if any of your friends have read Heartbeat.